A very common problem with all multiplayer Source Engine games, including Garry's Mod, is when you open your in-game server browser, it shows no servers. Are your server browser Filters set to default? Can your Garry's Mod connect to any servers? Does any other Source Engine game on your PC have a working server browser or does the Steam Server Browser work? 1. Are your server browser Filters set to default? If some of the fields are not like they are no the picture above, change them so they match with the picture. After you are done, make sure you are in the Internet tab and press "Refresh All" button. If servers still are not being found, continue reading. 2. Can my Garry's Mod connect to any servers at all? To answer this question, you will have to manually find a server IP and try to connect to it using the developer console. To find an IP address of a server, you can use services, such as GameTracker. Once you have picked a Garry's Mod server, copy its IP Address and launch Garry's Mod. Once you found a server IP, open your developer console by either pressing and holding your tilde key ( ~ or § ) or pressing F10. The game will now try to connect to that server. If such server exists, you should be able to connect to that server. 3.1. Does any other Source Engine game on your PC have a working server browser? 3.2. Does the Steam Server Browser work? 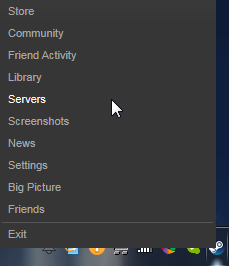 Incase you do not know what Steam Server Browser is, it's the built-in server browser into Steam. 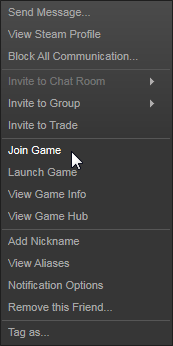 To access it you have to right click on Steam in system Tray and click Servers. Once you have figured out the likely problem, you can try to solve the problem yourself. The first thing you must do is to check all your firewall software and make sure none of them are blocking Garry's Mod from accessing Internet. Please note that some anti-virus programs, like ESET Smart Security or Avast, may include firewalls too, and you must take care of those too. You can try temporarily disabling all your firewalls to test if the problem is indeed caused by a firewall blocking Garry's Mod. This is the worst case scenario because there are a lot of things that can cause this. This can be caused by Installing pirated Steam games, fiddling with Master Server lists for Steam and pirated Steam games. Broken hosts.txt file for Windows users. A firewall or router is blocking one or all of Valve Master Servers. Exit from Steam, delete config/ folder inside Steam/ folder and start Steam. Exit from Steam, remove everything from Steam except for appdata/ folder and Steam.exe and start Steam. Answers to the 3 questions from "Finding the problem"